An asteroid half the size of a football field will buzz Earth today (Feb. 15) in a big way, coming closer to the planet than many satellites, and you can watch the cosmic encounter live online. At its closest approach at 2:24 p.m. EST (1924 GMT) today, the 150-foot-wide (45 meters) asteroid 2012 DA14 will cruise within 17,200 miles (27,000 kilometers) of Earth. The encounter marks the closest flyby by such a big asteroid that's ever been known about in advance, but there's no chance that the space rock will hit us, experts stress. "No one on Earth is in danger, nor will any of our satellites be hurt or damaged," Jim Green, director of NASA's planetary science division, said in a video released by the space agency Thursday (Feb. 14). You can watch the asteroid 2012 DA14 flyby on SPACE.com today during a series of free webcasts. NASA will provide two webcast views of the asteroid, with several other professional and amateur groups joining in with other broadcasts. "We're going to use our radars to bounce radio waves off this asteroid, watch it spin, look at the reflections and understand its size, its shape and perhaps even a little bit about what it's made of," Green said. Meanwhile, astronomers are working to identify what type of meteor exploded over Russia early today. According to Russian authorities and local media reports, a meteor exploded over eastern Russia in the Ural Mountains early this morning, shattering windows and injuring more than 500 people. It was not related to the asteroid 2012 DA14 flyby, NASA officials said. The flyby of 2012 DA14 will be a treat for some well-placed skywatchers, too. 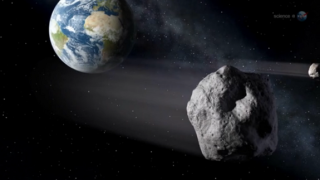 While the close approach occurs during daylight hours in the Western Hemisphere, shutting out observers there, stargazers in parts of Europe, Asia, Africa and Australia have a shot at seeing the asteroid today. And wherever you may be, you can watch the flyby live on your computer. In addition to NASA's main webcast and evening broadcast by the agency's Marshall Space Flight Center, the online Slooh Space Camera will provide views from observatories in Africa and Arizona. The Virtual Telescope Project will provide images from Italy, and the Bareket Observatory in Israel also plans to host a webcast. The webcasts will come in handy, particularly because of the challenge presented by observing asteroid 2012 DA14, stargazing experts said. The asteroid will be extremely faint and will be moving very rapidly across the sky, making it hard to track in telescopes. "Being about half the size of a football field, this asteroid will be slightly too small to appear to the unaided eye," said astronomer Bob Berman, who will participate in the Slooh Space Camera webcast. "And although simple binoculars could theoretically see it, its rapid motion will make locating this asteroid a major challenge for all but a small coterie of dedicated, serious astronomers with good star charts and a clock providing the absolutely correct time." Today's close approach serves as a reminder that Earth sits in the middle of a cosmic shooting gallery. Our planet has been pummeled by asteroids many times over its history — perhaps most famously 65 million years ago, when a 6-mile-wide (10 km) behemoth of an asteroid wiped out the dinosaurs — and it will continue to be struck in the future. We probably don't have to worry about a potential civilization-ending strike anytime soon. NASA researchers have mapped out the orbits of 90 percent of the biggest and most dangerous near-Earth asteroids, and none of them seem to be on a collision course with Earth in the foreseeable future. But there are a lot of smaller space rocks waiting to be discovered and mapped. Researchers have identified just 9,600 near-Earth asteroids, but they think a million or more are out there, whizzing silently through the darkness of deep space. Astronomers estimate that asteroids the size of 2012 DA14 buzz Earth this closely every 40 years and hit our planet once every 1,200 years or so. If 2012 DA14 did hit us, it would probably cause severe destruction on a local scale. In 1908, a space rock thought to be of similar size exploded over Siberia, flattening about 825 square miles (2,137 square km) of forest.